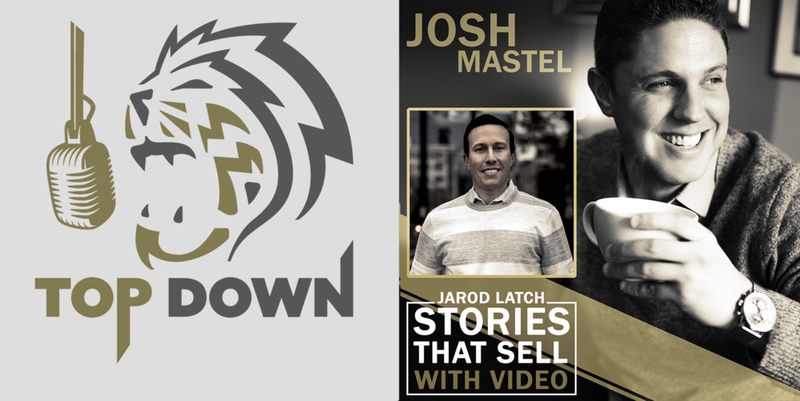 Josh: Hello and welcome to episode three of Top down, I'm Josh Mastel your host and the CEO of Uproar Partners, we help business owners and start-ups drive sales by building and managing effective sales teams. Awesome Jarod I appreciate your time today my man. Jarod: Absolutely, happy to be here. Josh: I was excited to have you on today because you know we're going to talk about video and the sales process and in a sales world, and I think you have a really incredible story in terms of your background of what you were doing before you got to you know running Spiracle Media now, so I like to actually start-- if you don't mind it's kind of giving the listeners here like a little background history of what's brought you to what you're doing today. Jarod: Yeah I'd be happy to do that and I appreciate you having me on today and it's hard right now when I look back, and it's been about 20 years in media, digital, broadcasting. I started out in radio, I had gone to college to play baseball, I'd gotten injured and got into radio at that point because of an elective sports broadcasting class which I saw and I thought you know what this is really cool, I could try this. So I started in radio in college, from there right out of school I was fortunate to go back to my hometown in Johnstown Pennsylvania, and get a job in TV as a weekend sports anchor, this was when I was about 22 years old. So what that did was give me the ability to do something that was really fun, I was working in sports and a really good market to start in, I was able to build on a lot of different skills from shooting, editing, producing, the market was top 100 which was great but at that point you were asked to do more as so many people are in different roles. So it was the shooting, editing, producing, and then eventually it was-- we had to update the website you know following a show at 11:40 at night, and then we had to start to tweet. So I was part of this evolution of technology naturally which was great. So then I was able to come to Charlotte in 2007 to work for a local ABC affiliate station in the same sort of role as an anchor and reporter, and then around 2010 I met my business partner when I got here in 2007- Tim [Baer?] and off and on we talk about you know what's next after television? Getting out of that grind, getting out of those hours, what could we provide of value that has been a direct result of our experience? And what we thought about at that time was working with athletes, and how they could leverage their brand their following on social media when it came to Twitter, Facebook, the different vehicles that existed at that time. So we decided to take a leap of faith and we started Spiracle Media in 2011 to work with athletes. And that's how we started and we were able to get Stefan curry on board when his first couple years at the NBA, we worked with him for at least three years with his digital presence, we also worked with Ricky Berens who was an Olympic swimmer, this is when he was in London I believe in 2012, he was able to get a gold medal on the relay team with Michael Phelps. So those were neat experiences and then you fast forward to around 2013, our third business partner Bill [Voge?] who had been with us decided that he had the journalistic itch. He went back started an independent Panthers website and at that time we pivoted from video, hired-- really a golden hire in David Kernodle, and we switched gears to video. So that's where we are today but what has been really neat you know going through that process again is just growing and evolving with the technology, and realizing what the need is, and staying on the cutting edge which we're trying to do all the time. Josh: That’s awesome and I love that. You've really run the whole gamut of media from radio, to TV, to social, now into the video world where I know you guys do a great job working with your customers and helping tell their stories to use in the sales process to get viewers coming back at them, let's talk about that video piece. Where do you see video positioned in the market today as it applies to-- and let's really be clear on who our listeners are, which are a lot of start-ups out there, a lot of small business owners, where does video play in that world today? Jarod: I think video plays everywhere. And it is a dynamic and powerful tool and when you look at what it does first of all, it engages an audience like no other media. We know that even going back to movies, and we watch content and we love to be engaged and been watched, it's because of the video and the story and that visual that pulls us in, but then the other part of that is providing the information, the retention of message, again highly visual, and what it really does is lead to conversions in terms of providing a sentiment and action and there's really no replacement for it right now. So it can be found in in many different ways and we produce a lot of videos on our end to give as a sales collateral, tools in meetings, tools coming out of meetings, it's really a value that needs to be in nearly every part of that process. Josh: Agreed, so let’s say you're a small business owner and you want to figure out where to start, what do you think is the most important piece of video content any company can produce or get produced for themselves to use as the first go at it? Jarod: I think there's two. I know you asked for one, but I'm going to give you two it's hard for me to delineate between what's more important. The one piece to consider is the culture and recruiting piece, because we know as small business owners what is imperative to our success is hiring top talent, finding the right pieces. When you have limited resources, you need to make every one count. So establishing who you really are and being able to share that message to get the right people, I think is number one. And then number two is catering to the audience that you're looking to sell to, and that is presenting your differentiators in a way that can be consumed rather easily and clearly. And if you can do that with clarity, I think those two pieces are essential on the front end. The culture piece and then the differentiators, because people need to have clarity on both of those. Josh: Now are there a ton of different options for how to create-- like what the video should be for that differentiator video that you're talking about? That one I feel like applies a lot to the sales process? What different ways are there about going about making that? Jarod: Well there's different ways you know you could do it in a basic sense of a tutorial, you could put together more dynamic promo that's voiced over, you can use real interviews and capture partner testimonials, but whatever you do you know you want to do it in a storytelling way, a way that is easy digestible and a bit entertaining and engaging because those are key you don't want to do the dry thing with one person standing there for three or four minutes, you want to be as short and concise to the point as possible with including your message. Josh: One thing I loved about you guys, as I'm a customer of you guys and when I was you know interviewing or talking to a lot of different video companies-- because I'm a sales organization myself, and I wanted to create video for that, the biggest piece that I didn't love about the industry was nobody really gave me a lot of direction about okay we can make you a good video that tells your story of why customers should work with you, but they never gave me coaching on how to use it afterwards like what do I do with that video now? Do I just put it on my website? What do I do with it? Well how do you guys work with your customers and/or what do you recommend is the best use from the video once it's made? Jarod: Well that's a great point because I think early on what we were seeing is that we were creating some really solid content and at the end of the day it wasn't reaching an audience in a magnitude of which it needed to. So what we do with each of our partners when we start this process, is go a little bit more in depth. And there's a couple basic questions that you have to ask yourself and you have to answer on the front end, and that's who's your audience, and what are your goals with this video? I think that as you see in the adoption curve you have companies that are doing it well, you have some in the middle but aren't quite sure how to utilize it, and then you have the companies on the end that they know they need video and have no idea how to use it. So we come in there, ask those two questions simply- who is your audience, and what are your goals? Then from there we need to look at your existing platforms where is it going to go? Are you going to use it on your website, are you going to put money behind it as part of a Google ad campaign, or are you going to use money in the social media space? There are a lot of different ways that you can use it, you can do traditional media buys and now some of those traditional media buys have shifted online, and then from that we really need to break down the deliverables and look at how long these things need to be, and aesthetically how we need to tweak them for each platform. And that's all part of you know understanding where it's going to be distributed but if you don't answer that question first, who is your distinct audience for this specific content, then it's not going to lead you to the end result of where it goes. Josh: So now if I have a sales video and I'm bringing people into the site or let's say I'm getting-- people are searching for me online or searching for what I do online, and there's a video there that brings them in, that's kind of a first video you recommend that a company use in the sales process, what's step two then? So after the culture one like you talked about as well, what’s step two in terms of is there some things that we can do during the sales process now where we can be providing video to people that's going to help them along that buying journey? Jarod: I definitely think there is because that culture video on the front warms the plate up, and then in between you've really got to make your pitch. So a couple different videos have to be in place that are reflective of your offerings again going back to why are you different? If I'm working in a crowded space with several different companies, why choose you? So that's where you have to have some really pointed videos on what you offer, so you can follow up- it allows you some customization in your response, and it's supported by video. So I'd go with those specific offerings and you know getting a little bit more into the nuts and bolts of what you do, and continuing that message on why you're different. Josh: Let’s really try to provide some value to a lot of listeners here. Okay, I'm a small business owner, usually cash-strapped, I got to use a little bit of my money to do some kind of marketing stuff, I’ve got a good site up, where can I start? Let's say I realized the power of video, I know I should be using it to draw more customers in, it's an investment, the ROI is really pretty clear, where do I even start? Jarod: Well I'd start with the simple stuff. You know if you can do a minute video, and put it out there and put some money behind it, because there's no reason to really dive into video unless you're going to be serious about it, because the quality is good across the board now so does it make sense to make videos that are poor quality. To me that's off the board you know that's worth waiting and saving up and making sure you have budget in place to do it correctly, but that's just the way I've always done things. You know if you're going to do it, do it the right way. So with video it's no different, but you could start short and make sure you do have money to put into distribution whether that's a Google ad play that you're looking to attach video to, if it's another push social media to get people to a landing page, put something behind it, test it out for two to three months see what your return is, see what works, and then engage in a different way. So that's how I would read that off the bat. You've got to put a little bit behind it, you don't need to do the whole thing but you also need to sit down and really map your strategy out with a company that understands who you are, but more importantly how to break things out and place them in the right spots. Josh: Yep, now dare I try to do it on my own? Jarod: It depends. It depends on what it is. I would first talk to somebody and I know we've had conversations, there are certainly applications where you can do it yourself, but when I'm out there trying to really truly sell my service and my product or my culture, those are things to me that need to be done right in high quality, because if people are going to come to see a poorly done video on culture, I think that's poorly reflected on your culture. So you have to be very careful but there are certain applications where you know you want that spontaneous video, they get to know you, those things can certainly be done on your own. Josh: I'm sure you know the industry well, you know your competitors well, one thing I love about you and Tim and running that place there is you really care about your customers and you care about your par-- you guys call them partners, I love that. You know I'm not actually here to bash your competitors whatsoever, I know you would never do that, but what should people be aware of-- let's say someone's listened to this and they don't live local to Charlotte North Carolina where we are where it’d be easy to talk to you guys, let’s say I live in a different country, what should someone be aware of when talking to a video production company that could potentially bite them? Jarod: Well I think the first is trying to identify if this company or agency is going to be a comprehensive partner. We have naturally built Spiracle Media on relationships and it comes from our days in journalism where relationships were really important, and they were genuine, and thankfully we've been able to carry that over into the way that we conduct business on our end. And make sure they want to get to know your business, and it's not just a transaction. We have partners that we work with, and an extremely high percentage if not almost all of them are recurring work for us, in a recurring partnership. So that's number one make sure it's a comprehensive relationship on the front end. The other is just response time if you're not important enough for them to get back to you in a timely matter or manner, I think that's a red flag. And then look at the experience because storytelling is a buzzword out there right now, but as for us you know we've spent 10 to 15 years even longer as journalists and we've got a team that's very good at shooting cinematically and assembling a story, and there are so many places that shoot great video but you've got to rate and see if they can actually assemble the story because those are two different things. So those are three areas that I would try to get a read on before choosing an agency or moving forward in that process. Josh: That's a great point on the storytelling I think the American consumers eyes are so programmed to expect beautiful. Everywhere we look, there's beautiful video, I mean I can shoot a video on my-- you know I just got the new IPhone 10, I can shoot a video on that is probably equal quality to just about anything a consumer can see, so we're so used to that. So that does bring up the importance of the ability to tell that story. Why do you think people respond to and love stories so much? Jarod: Well stories are all about characters and people like to attach to characters. You know we can call them heroes in real life that translate into the medium of video. So that's it in a nutshell, I mean people like compelling stories they like to see people that face challenges and adversity and show resilience in getting past those. So that's all in the character development as part of these stories and that's why it's different and you know you mentioned you could shoot great stuff on your iPhone, and people can have really nice-looking video. I always tell the team in meetings and I remind them from time to time that we’re at a point right now where we will always try to innovate our quality, we’ll add new tools when necessary to make it even better, but it's not our quality that will differentiate who we are at Spiracle Media, it will come down to you know that comprehensive partnership, and the relationships, and how we deal with our partners. That is what's going to separate us plus the experience piece and ability to tell a story. So that's why that's critical and that's why people gravitate toward that because it's all about the characters and that human connection. Josh: Sure so I would imagine then some of the best stories in the sales process to tell your prospects are the stories of actual customers that you already have, where they've been and why they've chosen to work with you is that correct you guys try to do a lot of that kind of storytelling in that [inaudible][00:17:42]? Jarod: No doubt about it, that is the best way to talk about your company is through the eyes and the voices of the partners that you've worked with and made an impact with. Whatever that service is, you've made somebody else's life better and people on the other end that are considering using your service, or your product, want to see real people in real situations, and that impact. So that is the best way to connect people is to use your current customers and showcase that impact. Josh: How do you pass the sceptical eye you know a lot of people when I'm seeing a video or commercial, I'm always-- you know I think a lot of people have that guard up that oh I'm trying to be—someone’s trying to sell me something, and people get really defensive? How do you break that down to make these stories believable that this isn't a staged commercial, this is actually a person telling an actual story is there any advice on that? Jarod: That's a tough thing, but it's just I think how we measure things in real life and it comes down to authenticity and getting people comfortable, you know doing real interviews and asking real questions, and getting responses that are normal, you know not feeding people something to say. I think we could all tell when somebody has a canned response. And that's the only way to really read that is in how authentic you think this story is, and I think you can tell more times than not if that's present and how much to trust it. Josh: So I know you've mentioned talking about a process when you're engaging with the new customer about making sure you know and the why behind the video, and what the purpose of it you know it is, how do you guys attack that when you're talking to a brand new customer to make sure that you're being really effective and getting a ton of value in our [inaudible][00:19:25]? Jarod: Well I think there's a couple of different things to go into that, that's a good question. You know spending the time on the front end is critical with the brainstorm and the strategy and laying out some defined steps, because everybody likes direction especially if they're undertaking some sort of new process, and video or at least doing video right, is fairly new to most people. So we want them to feel comfortable on the front end so there's no surprises, they understand what the expectations are on our part and on their part, and then once we do that you know getting into the actual production, that shoot day is all about them. So we want to make sure that our teams are making it fun, enjoyable, taking the stress out of it, and then once we get things back in hand and we start to go through all the materials, we like to deliver in a timely manner. I think that's one thing that's missing throughout this industry and I think it's a result of the volume of work and that there's a big pool of opportunity, but delivering those things on time, and then working through with the partner on the backend to get it exactly where they want it to be in terms of evaluating the messaging, the way we are assembling it, the way it's being delivered. So we go through that entire process with them, one thing that we really enjoy doing is educating people on what that looks like and drawing on our experience and just trying to make it fun and enjoyable because it doesn't have to be over-complicated. I think a lot of things in the creative space have naturally become over-complicated and usually you have a lot of egos in the room and that's a direct result of that. But we like to keep it simple, but come up with these big results but that all comes with just setting the expectations and continued communication throughout. Josh: That's great and one thing I loved about you guys and I was initially talking to you is video can be an intimidating thing right, like I know that I need one but I don't really know how to do it and you guys do a great job of just taking the reins and realizing that stress and just saying, ‘’hey, sit down we're going to ask all the questions.’’ You know we're going to help guide you down this path, you don't have to think of everything we've already thought of everything, and you guys do a really good job of making that really easy. Jarod: Well I appreciate it. We really want to be an extension of the team, and we want to make your life easier, and we want to help you define exactly what you want, and then help you to get there. And that's something that we truly enjoy doing and that-- we want to take that stress away from you. Again because it is new, it's uncomfortable, it can be stressful, and we just want to alleviate that burden. Josh: The second topic I want to dig into your brain on is something I've-- you know I know you've experienced quite a bit over the last seven, eight, nine years, you’ve been running your business in that I happen to know you and Tim really well, in that you guys have been business owners running a really successful you know have got a really good reputation business, at the same time as running that business you guys are both been in charge of you know the selling of that product or the service you guys provide. 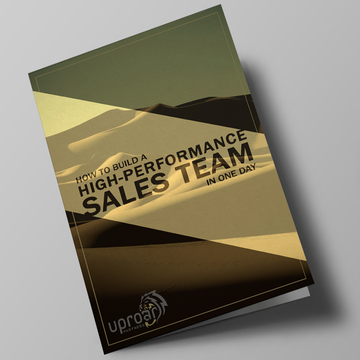 Can you kind of talk about-- and I think you're probably in the same shoes a lot of our listeners right, business owners who are-- I call them you know they're on the treadmill, they're running the business but they're also the top salesperson? What's your experience been over the last seven, eight, nine, years in that regard, having to kind of carry both plates? Jarod: Well the biggest challenge I think is doing a lot and feeling like you're not getting anything done. And that has been the frightening scenario at times when you're running your own business and I know that the business owners listening to this can relate to that. But the biggest thing now is what I have tried to do is concentrate on less, which doesn't mean that you're doing less work, but you're actually making a bigger impact and you're doing more. But the only way to do that, is to get the right team in place and really define the rules around you. Develop that trust, empower, and understand that it can get done. My biggest struggle has been the handoff from project management and sales, and being the one in the field, being a face for the company since we started now over seven years ago, and now trusting everybody else with that because in turn this is like another child for me, with the company you put your sweat and your time and your tears and everything into this business. So it's tough to get to that point, but it is and having the faith in the team around you and being able to empower and then focus on the things that truly matter. And that takes discipline in blocking time on your calendar and really focusing and getting away and thinking and the only way to do that, is to try to work at it. So that's been the biggest struggle with me. You know feeling like I'm doing a lot, you use the analogy of the treadmill, we could say the hamster wheel, all those things apply and you are doing so much but really those things are continuing to hang around longer than they should and you've got to lessen those priorities. Josh: Yeah I mean I know you have a great business partner in Tim, and you guys have a great relationship, explain a little bit about that relationship. How do you guys chop up roles, where does sales fit in the chop of those two roles, how do you guys balance that? Jarod: Well I think probably about two years ago we made a distinct play on the roles, and we figured out okay as we continue to grow-- and you have to do this across the board, but with Tim and myself, we are always continuing to redefine where we should be spending our time and who should be doing what. So Tim has really taken the reins on the business development side which includes sales, and we brought in a sales person recently within the last month which has been another interesting transition for us because I mentioned the trust and empowering somebody else with the message of your company and taking that to people, that is a weird thing when it when it first happens. so Tim's on that business development side, I work on the creative side, I come in with the clients that go through the brainstorm I've worked with the marketing and I'm trying to drive our message and our brand and wrap those things up, and you know have a clear message for people on exactly who we are and what our differentiators are. Then the last piece of that is supporting Tim with the business, and whatever he needs in terms of sales, but you need to define those roles clearly and figure out what's your partner's doing so that you're doing something that is complimentary, and you don't always need to be in each other's business but you need to be connected. So that's the little happy dance that you do to keep each other accountable and in more, support each other because that's the most important thing and it's nice to have a business partner in that way because as small business owners, as entrepreneurs, you're on your own island and nobody off the island truly understands what it's like. So to have a quality partner in Tim is invaluable. Josh: I don't have a partner in my business I just have chosen to do it that way, but yeah I feel like there's a part of me that's always kind of scared of having a partner because I think you only hear the bad stories, you only hear the ones that go really really wrong, and you guys are a great example of two people I think that's really figured out a way to balance and run the business together. Let me ask you this, who's the better salesman you or Tim? Jarod: You know I think we have two distinct sales method-- methodology is probably not the word, approaches. I think Tim is more straightforward and bold for sure and maybe I'm a little bit more nurturing with my approach. So I won't give the edge to one or the other, I think it's-- scenario-based I think we're both very successful especially when the plate is warmed up because again we approach it in a relational way and not a transactional way, and I think that is the key to sales because I know myself I don't like to be hard sold. I don't like somebody showing up unsolicited and trying to sell me something, but if it's a conversation and we can sit down and we can talk about the value and what each other is doing, and maybe there's a way to complement one another, that's what we both do and we pride ourselves on that and it's a natural way. But if I have to put Tim in the ring out, I'll do that all day. I'll let him go out and I’ll-- you know good cop bad cop is what we always say in the office. I like to sic him on people in those situations because he is very good and he relishes it. Josh: Last couple of questions I have, for a year you mentioned a really great point earlier about the fear of-- now seeing a lot of our listeners are probably in this boat right, the fear of you’re the sales guy- you and your business partner, are the sales guys, you live and breathe your brand it’s everything to you, but to grow and scale you have to be able to clone yourself right? You have to be able to get other people out there that could do an equal job of selling that than you are, so there's a natural fear with that. How have you guys dealt with it? I know you mentioned you just brought on a sales person, and how did you guys to get over that, and how are you dealing with it? Jarod: Well you have to nurture again because there's great care with the messaging and the brand and when you sit there and you say, ‘’well I don't I don't have time to properly manage this person,’’ well you better find the time especially on the front end and you need to pay attention because the extension of your brand means everything, the reputation of that brand, how people perceive you because perception is strong especially with a salesperson who’s going to be reaching out to people outside of your immediate network, people that most likely you don't have a relationship to. So that first endpoint is significant. So you need to continue to evaluate over those first couple of months, you need to provide feedback, you need to be encouraging, you need to provide examples, one thing that we did was come up with some scripting and bullet points on how those calls should go, but what it was was just a reflection of our value-adds, our brand points for reference. And using that over time and getting some reps in, eventually you don't need that piece of paper in front of you. But you really need to put front and center what is important to you, and what really matters, and continue to go after that and so that person truly understands who you are. And I would say in the beginning it's going to be hard, it's going to be weird, it's going to be uncomfortable, but if you are there, and you’re hands-on but not suffocating, because this is not an opportunity to micromanage, this is an opportunity to encourage and put the right system in place so the right message can go out. And if you can do that I think you have a great opportunity in front of you to relieve some burden and some stress off your shoulders, and continue to reach people that have not been reached before with your brand and your service and your product, and at the end of the day that is what is most important and that's what we all want is some help in addition to that team to reach people that can be potential partners. Josh: One of the greater learning lessons when you start to scale you know by bringing other people in, is it forces you as the business owner to take all that information you have in your head, and you have to extract it all and put it into words that can be trained and replicated that you put it on paper and you create a process out of it. So it's always a beautiful thing when you see that information coming out and finally being put to use. Jarod: And I'd say Josh, you know being uncomfortable is a good thing because uncomfortable allows us to refocus, and really try to see things with greater clarity and where we're trying to go, and who we are and you start asking all those questions. So uncomfortable is good and I always tell these guys you know we need to work with controlled urgency because you want to stay in front of your competition, and we're in a very saturated space with video and we feel very good about who we are, but we're always looking to evolve you know who we are and add additional value to what we provide, but you need to work with that controlled urgency and those points of being uncomfortable are good because you get back, and you strap back in, and you focus a little bit more. Josh: Love that well if you're if listener dialled in here, small business owner, large business owner, and you need your story told Spiracle Media Jarod, Tim and his team, there's no one better to do that with to bring your customers in as a sales tool for using video. I'm really glad you're here Jared, one last question as I end this podcast line is, I'm on a mission- a personal mission to try to figure out the epidemic in this country around the amount of failure in sales teams, failure in start-ups, failure in small businesses, I'm trying to figure out what's going on, if you had to answer that question as a business owner that's made it through the seven year mark you guys are doing very well, what do you think is the top one or two things that's just killing sales teams, small businesses and start-ups out there? Jarod: And if I to go out on a limb, I would say patience and care. And what I mean by that is we want instant gratification in life, we want results right away and in most cases that's not realistic. And once you're bringing somebody in that is proven in your industry to a T, and understands your brand and its purpose and it's why, and I don't think that is available in most scenarios. And because of that we create a culture of fear and dysfunction because we're not patient, and we don't care enough. So if I were to guess that would be my guess of what needs to be interjected in more of these situations to breed more success, and that is to be patient and to care. And if you care, you take that person under your wing, and you truly give them the value that you want to express, and a way to do it. Josh: All right so Jarod if I'm a listener today, small business owners start up large business owner, and this hit home to me that I feel like I really need to do a better job of using video in the sales strategy to tell my story, where should we guide people like where would you like them to go? Jarod: Well the first place they can go is to our website at spiraclebuzz.com, you can also find us on twitter at @spiraclemedia, and one thing I want to mention we also started an arial brand a few months back called Arial Buzz, so we do drone services in the video and photography world as well as mapping and modelling, so that's also available and that website is arialbuzz.co, and you can reach out to me directly via email at Jarod, J A R O D @spiraclebuzz.com and I'd be happy to talk with you even if it's just questions, again we're happy to be here as a resource. Josh: Great thank you so much. Josh: All right just to recap three things number one, remember that effective storytelling skills are key to selling your brand either learn how to do it yourself or find someone who does that can help you tell your story. Number two, the two videos every single business has to have in 2018 is a culture video, and a differentiator video. Find someone to help make you a great one of each this is a powerful combo to make an impression in your target’s mind. And number three, uncomfortable is good. Work with controlled urgency and manage expectations with customers and partners. Process and hard work are key in figuring this out. Thanks for tuning in to today's podcast make sure to subscribe so you can be the first to hear about future stuff that we're putting out, and share this podcast with your friends or anybody you think that it might be a benefit to or feel free to visit us at www.uproarpartners.com or feel free to visit us at uproarpartners.com. If you want to send me any emails directly, feel free to hit me up at letshunt@uproarpartners.com. Thanks for listening have a great day, and remember everyone wants to eat until it's time to hunt.